I like gravlax, raw salmon cured with salt. Instead of buying a few slices in a shop it is really easy to make your own. 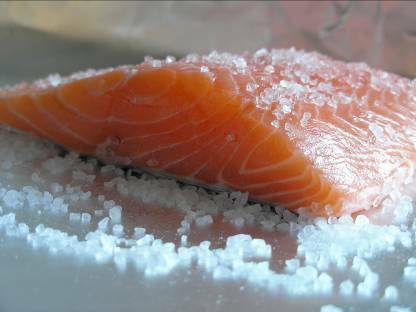 Basically all you need is a piece of raw salmon and salt. Rinse the piece of fish under cold water. Dry up with a piece of kitchen paper. Take a big enough piece of aluminium foil in which you can wrap the fish. Spread 2 spoonfuls of sea salt on the foil, place the fish on the salt on foil and cover the fish from the top with salt, a little sugar, dill or pepper. The salt does not have to cover all the fish in a thick layer, I prefer to spread the salt loosely and sprinkle just a little sugar. Not overdoing with salt leaves the fish juicier. Leave to cure overnight or for 24 hours. Before eating depending on the amount of salt you used you may need to rinse the fish very briefly with cold water to get rid of the excess salt. Especially if you want to make salmon tartar or just like to cut a little thiker slices than normally available it is worth curing your own salmon.